GRAFTON — Two members of the public grilled the town’s Selectboard on Tuesday with questions about the planning commission and a meeting between the board’s chairman and a representative from an energy company constructing a test tower. 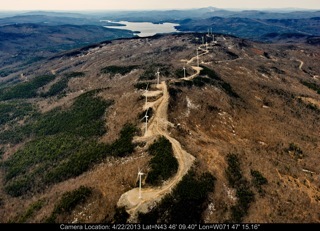 Iberdrola Renewables, operating as Atlantic Wind LLC, is one of the world’s largest energy companies and received permits to erect three test towers — two in Windham and one in Grafton on land owned by New Hampshire-based Meadowsend Timberlands Limited. The towers could be a precursor to Windham County’s first commercial wind turbines, depending on the weather data they produce. The project has considerable opposition from the town and residents Liisa Kissel and Anna Vesely questioned why Selectboard Chairman Al Sands has had two meetings — including one involving lunch — with someone from Atlantic Wind and Meadowsend. Vesely, who once served on the Selectboard for eight years, said all such meetings should be documented for public record. Kissel said she would like an update on the meetings but the Selectboard members at the front of the room said they had none for her. They said she would have to ask Sands, who was not present. Kissel said all Selectboard members should be informed about the two meetings. Earlier in Monday’s Selectboard meeting, Kissel asked why the board decided to keep a five-member planning commission when at least two new candidates had been recommended. She said the commission traditionally has had seven members. Kearns corrected her and said any notion of such a tradition is untrue. He said there have been fewer than five members in years past. He also said the depth of the commission is up to the discretion of the Selectboard, which decided five was sufficient. Kissel said the planning commission had accepted two candidates and wanted to have seven members within its ranks. Vesely chimed in with a comment of her own. “When we the public here see that the Selectboard has decided not to accept two recommended candidates that the commission itself was content with, we’re saying, ‘Hey. What gives? '” she said Monday. She said the Selectboard always accepted the recommendations of planning commission when she was on the board. Kissel said the townspeople deserve to know the grounds for the Selectboard’s decision. “The grounds are that five people are enough,” Kearns answered. Domenic Poli can be reached at dpoli@reformer.com, or 802-254-2311, ext. 277. You can follow him on Twitter @dpoli_reformer.